On Monday, the Supreme Court ruled a lawsuit filed by former child slaves against mega-corporation Nestle can move forward. The decision finalizes a lower court’s prior ruling, which Nestle previously attempted to overturn in an attempt to halt suits from individuals who worked in the African cocoa trade as children. As Reuters reports, three former Malian child laborers, known as “John Does” in the case, “contend the companies aided and abetted human rights violations through their active involvement in purchasing cocoa from Ivory Coast. While aware of the child slavery problem, the companies offered financial and technical assistance to local farmers in a bid to guarantee the cheapest source of cocoa, the plaintiffs said.” West African nations are some of the largest exporters of cocoa, and though Nestle does not employ child slaves directly, the company consistently engages in business deals with farmers who do. When the story of the abused children garnered significant public attention, the candy companies claimed they were unaware of any such conditions. Though Nestle, Hershey, Mars, and other chocolate behemoths voluntarily vowed to solve the problem — evading impending congressional legislation that would have forced the issue — they dragged their feet, repeatedly earning time extensions from lawmakers. To this day, Nestle touts its investments in supporting local farmers and helping children — yet the practice still continues. A 2015 study sponsored by the Department of Labor and executed by researchers at the Payson Center for International Development at Tulane University found the percentage of children working in the cocoa industry in the Ivory Coast increased 51% from 2008-09 to 2013-14. Though some areas saw improvement, the overall conclusions of the study revealed candy companies had failed to eliminate child labor from their business models. In 2014, over two million children still worked in hazardous conditions in Côte d’Ivoire and Ghana, combined. Monday’s Supreme Court ruling dealt with a 2009 lawsuit filed by three Malians who attempted to sue Nestle and other chocolate manufacturers under the Alien Tort Statute. They alleged forced labor, whipping, beating, and other hazardous conditions. In 2010, a U.S. District Judge dismissed their case, arguing corporations may not be sued under the Alien Tort Statute. 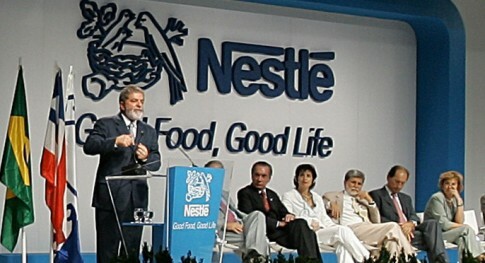 Nestle fought to appeal this decision, which the Supreme Court dismissed on Monday. Many corporations have evaded similar charges based on the Supreme Court’s 2013 ruling in Kiobel v. Royal Dutch Petroleum Co., which involved 12 Nigerians who accused Royal Dutch Shell of aiding state-sanctioned violence and torture. The court ruled, as Reutersreported, that “the 1789 Alien Tort Statute was presumed to cover only violations of international law occurring in the United States.” The Supreme Court dismissed the Nigerians’ case, establishing a precedent. Slavery: A Global Investigation from Free the Slaves on Vimeo. And when will the people stop eating processed foods that are ruining their health, filter & distill their own water, vote with their wallets and boycott these corporate bastards?